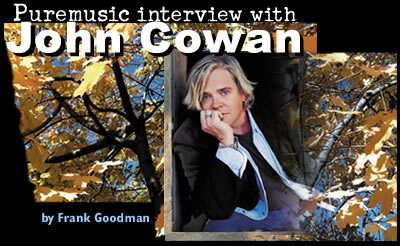 John Cowan is one of the most versatile and recognizable tenor voices in popular music. On top of being gifted with a fabulous set of pipes, it's an instrument that he's worked tirelessly since he was a teenager, in every possible kind of musical setting. Rock & roll bands, soul bands, country records and TV, metal bands, forget about it. But he is most well known for his sixteen years with the maverick outfit that changed bluegrass and acoustic music more singlehandedly than anyone else, The Newgrass Revival. The longest running lineup of the band was Sam Bush on mandolin and fiddle, John Cowan on bass, Bela Fleck on banjo, and Pat Flynn on guitar. But in several configurations and on several labels, they released over a dozen records. They charted with a couple of songs, but survived through relentless touring. This was before there was any Americana radio at all, or any significant public radio airplay for non-commercial music. For those unfamiliar with Newgrass, their approach to bluegrass included doing all types of material -- rock, jazz, blues -- and jamming in ways that were more familiar in jazz or psychedelic rock bands. They also never looked the conventional bluegrass part, they were definitely renegade hippie virtuosos running around the country's venues and festivals in a bread truck. They were literally trailblazers. A whole generation of musicians cites Newgrass Revival over and over again as a major influence on their music and their life. As John goes into in our interview, he invested many years after the demise of Newgrass in '91 into several projects, none of which really panned out in the career blueprint ultimately. Three or four years ago he started again in this vein he'd mined so long; he put together a band of great players, and made an eponymous solo debut for Sugar Hill Records, with his very talented friend Wendy Waldman co-producing. That record hit some very high points, as he continued to redefine his multifarious self. I hear a whole new pocket and comfortability in his music and his band in this new record, Always Take Me Back, and I'm happy to see it catching on at radio and retail. John's recent profile has been elevated by his association and cross-pollination with popular jam bands like Leftover Salmon and The String Cheese Incident. When Drew Emmitt of Leftover Salmon decided to make solo record, he used the John Cowan Band to back him up. (More on that in our interview with Drew Emmitt in this issue.) The John Cowan Band is playing festivals everywhere the sun is shining this summer.